Iron balconies proliferated in the Georgian period, when large estates of terraced housing were laid out in newly developed suburbs of cities and towns across the country. The uniformity of these terraced buildings was relieved by balconies at the first-floor level, which were both decorative embellishments and useful escape routes in the event of fire. 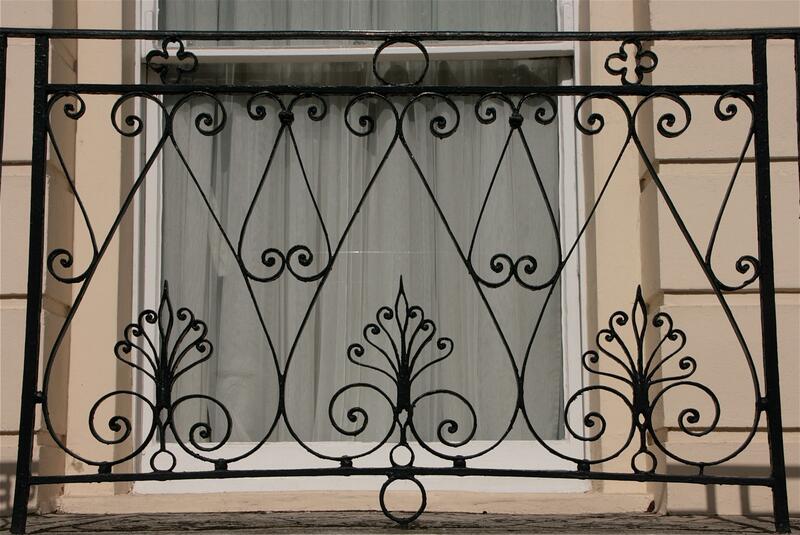 Early balconies were constructed of wrought iron but, as their popularity grew, this was increasingly substituted for cast iron which could be reproduced far more easily and cheaply. Early cast-iron balconies in the late eighteenth and early nineteenth centuries tended to be influenced by the prevalent architectural style of neo-classicism, a popular example being the heart and honeysuckle motif derived from designs by the architect Robert Adam in the Adelphi (1774) in London and seen in many balconies in Cheltenham and other spa towns (1). In the first decades of the nineteenth century, designs were increasingly drawn from pattern books created by architects or founders, which were effectively forerunners of iron manufacturers’ catalogues developed later in the century. 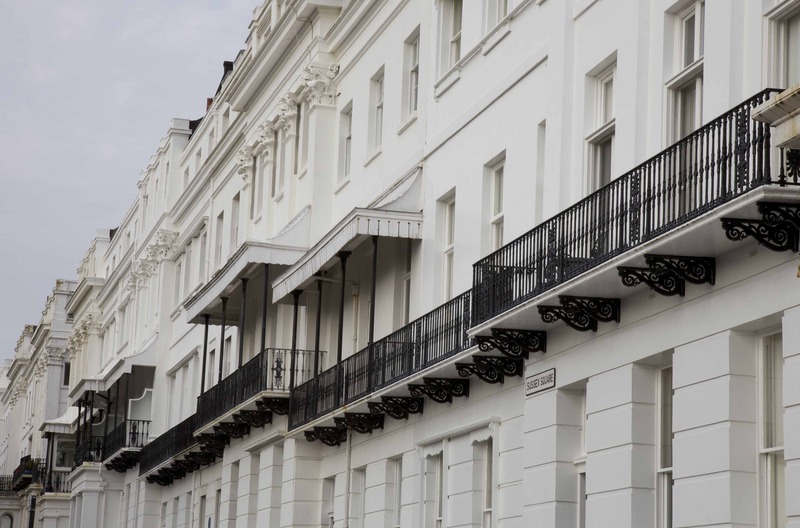 Yet, even as the range of designs proliferated from the 1820s onwards, balconies attached to Georgian terraces tended to present a uniform appearance in keeping with neo-classical principles. 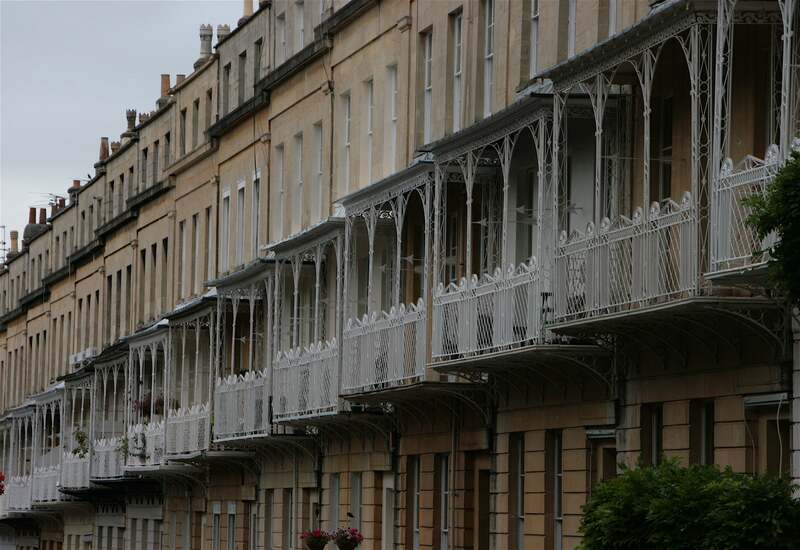 Thus, when balconies developed into covered verandas, such as in many of those in the Clifton area of Bristol (2), they nevertheless maintained a uniformity of both design and construction, following without deviation the exacting line of the first-floor windows. The strict adherence to architectural convention seen in spa balconies was not followed in their seaside equivalents. Brighton’s Georgian estates – Kemp Town and Brunswick Town – were built in the 1820s after royal patronage of the town led to an extended building boom, attracting wealthy visitors and residents mainly from London. In Kemp Town, the balcony was developed into an architectural centrepiece, whether as part of a terrace of bow windows (3), projecting bays on the first floor level (4), or a continuous but disjointed series of railings, verandas and projections (5). 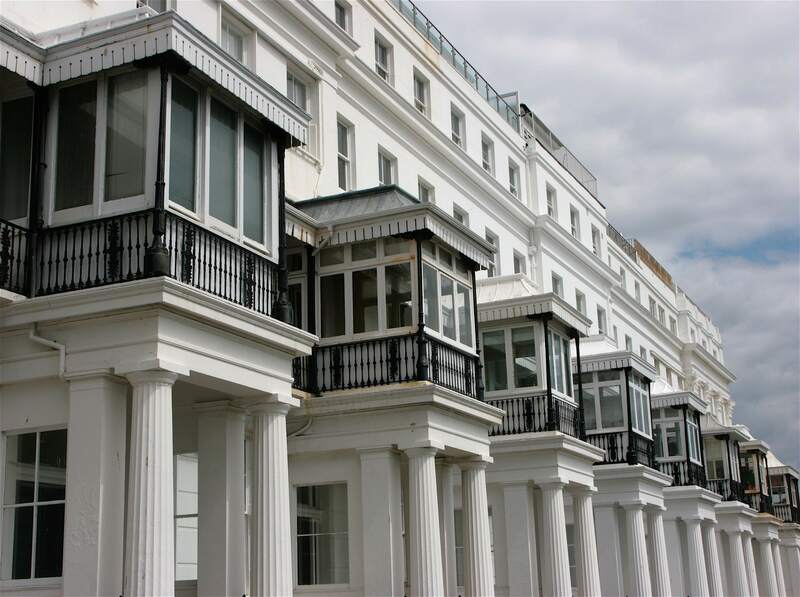 In the eyes of late nineteenth-century observers, the bay window was one of the defining features of seaside architecture, which in Brighton, depending on your preference, either presented ‘a brilliant face’ to the sea or created a sense of ‘sad monotony’. In 1898, The British Architect questioned what it termed the ‘morality’ of seaside bay windows. It viewed the consequence of a desire for access to sunshine and sea air being an architecture of competition, extravagance, even excess, with the ‘amiable bellies’ of bay windows jostling to get the best view of the sea. John Piper saw this ‘blossom and riot’ of the seaside balcony as a consequence of the primary focus of the Georgian seaside visitor: to look at the sea. This activity of looking out distinguished seaside balconies from their counterparts in spa resorts, which, as part of a unified architectural façade, were primarily to be looked at, a symbol of the occupants’ elevated social status to those who looked on from outside. 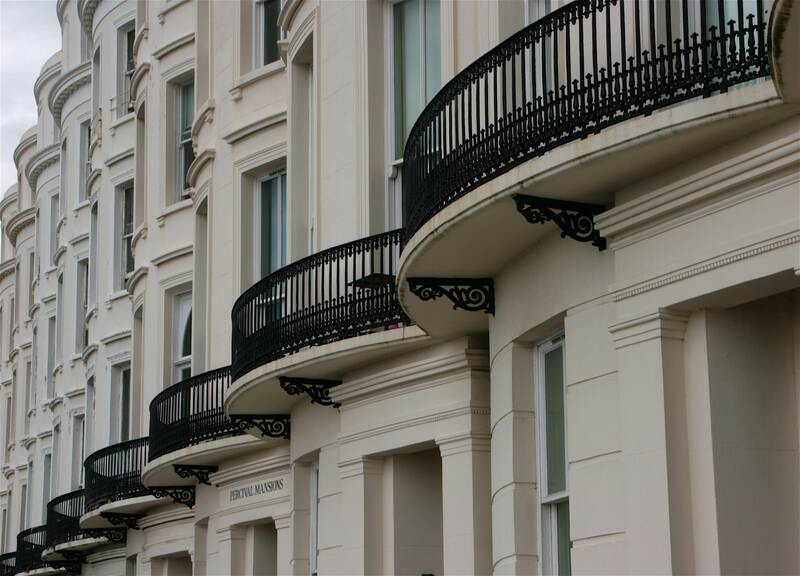 With seaside balconies, the extent of one’s ability to look at the sea became the mark of status; what resulted was the competitive extravagance we see in the balconies of Brighton’s Kemp Town terraces. 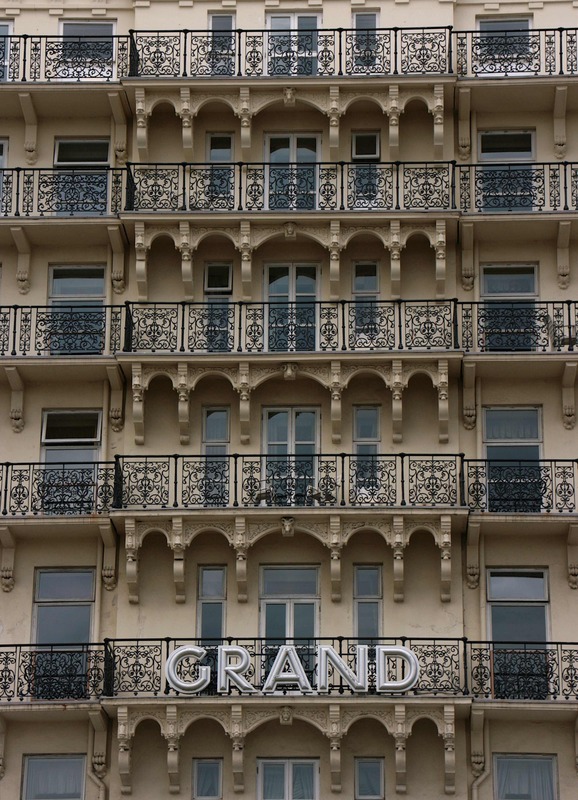 Such extravagance would later extend to seafront hotel buildings; when Brighton’s Grand Hotel was opened in 1865, The Building News felt unable to describe the building because its entire front was concealed by six tiers of ‘elaborate balcony railings which seem hung in rows like gilt gingerbread at a fair’ (6).